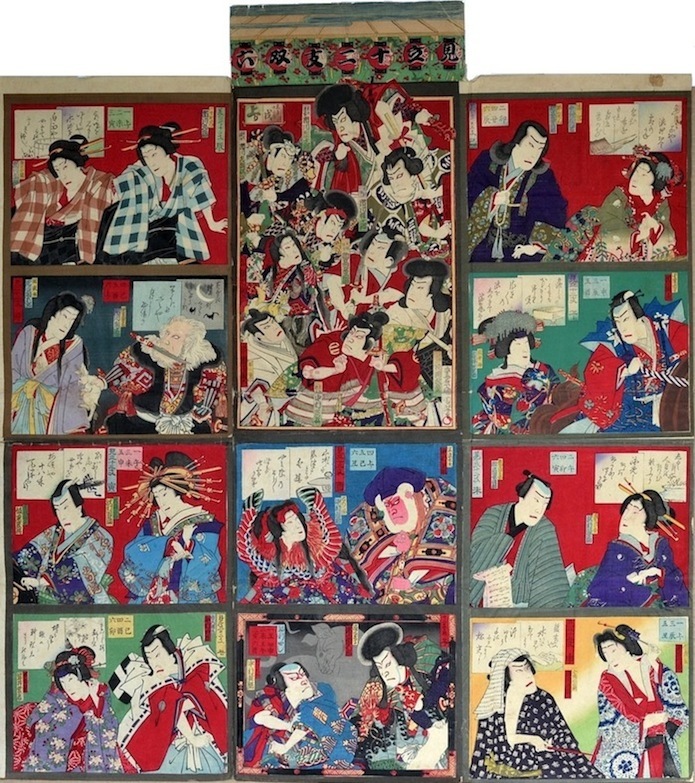 Toyohara Kunichika (1835-1900) "Kabuki Actors" Sugoroku Board, 1860’s. Six Sheet Panel in Three sections. Sugoroku is a Japanese board game similar to backgammon or snakes and ladders, depending which version is played. The game has its roots in ancient China and medieval Japan, although it really came to prominence in the nineteenth century where the ease of woodblock printing made it affordable to more people. Sugoroku boards are rare and they are very collectible. Unlike normal ukiyo prints, these pieces would have been constantly played with and used by the whole family until they fell to pieces. Some museums have examples but many are in poor condition. 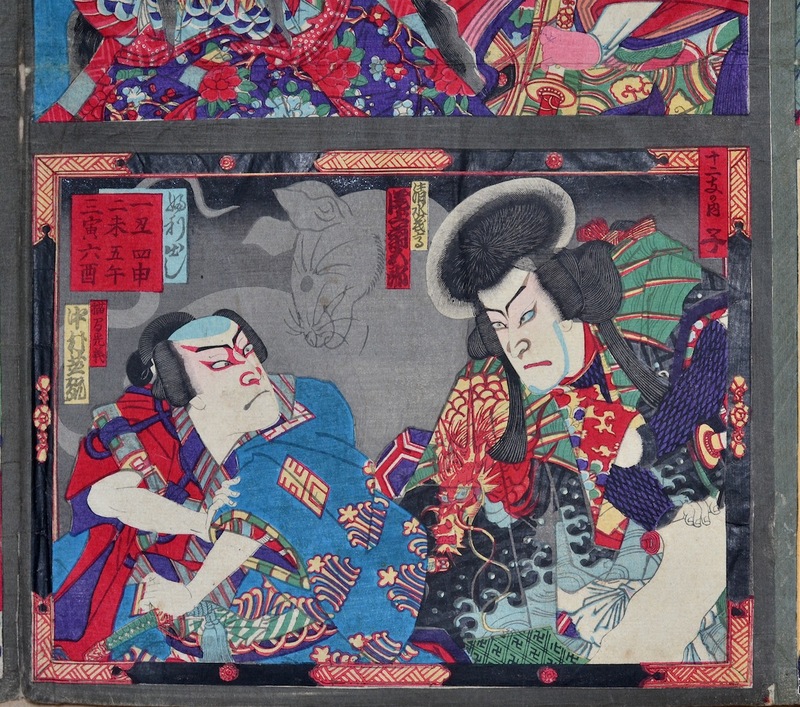 Kunichika produced several known versions of the Sugoruku game in the 1860’s. 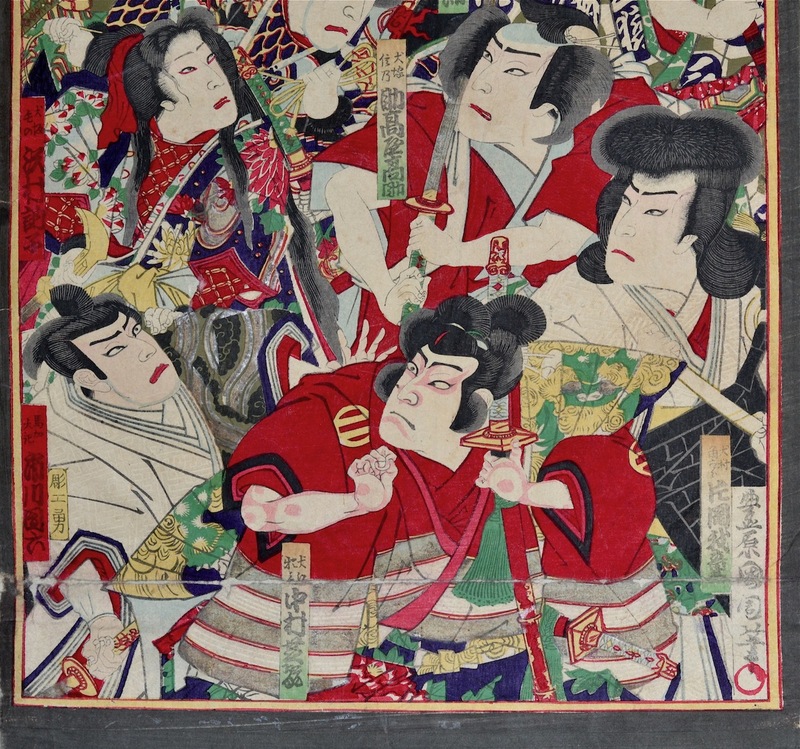 This huge woodblock represents heroes of the kabuki stage in pairs. There are ten separate plays in vignette panels and one larger panel portraying nine actors. Very unusually, the board is complete and carries the title block section on the top of the print. Panels include Iga no Jutaro killing a hare, the evil Nikki Danjo and his familar rat, the onnagata Princess Yaegati and many other onnagata actors. This is a very unique piece. Sugoroku boards are very rare and even more unusual to find one so complete and in such good condition. Unbacked and with original tape joints, the colour and impression are all fine with burnished shomen-zuri patterns and embossing throughout. The condition is excellent.